Step One – The Discovery Phase. In this phase, we gather information about your prospective site visitors, the overall business model, and your goals. Unlike many other website design firms, we spend A LOT of time collaborating with our clients to understand THEIR goals and vision, particularly near the beginning of the engagement. Step Two – Layout Phase. This involves making a visual aid such as a flowchart or wireframe to conceptualize the optimal structure for the website. How many navigational items will you need on the site, what will they be called, and where on the site will they go? Where will the logo go? Will you have a login box? Where will the content be located? Or what about images or videos, a search box, or a site map? This phase also provides us with an initial estimate as to the volume of content that would be required. Step Three – Initial Draft Phase. This is a very rough blueprint of the site, done primarily to get a rough feel (a “face validity” check) as to whether or not we’re on the right track. At this stage, we also involve the client to be sure that the site is progressing in the desired way. By the end of this stage, we have created the GUI (graphical user interface), and have created a rough mock-up of the content. Step Four – Design Expansion Phase. In this phase, we take our draft site and feedback from the client, and we expand out to a more formal draft, to then use as the basis for the remainder of the project. Step Five – Content Expansion Phase. Here, we fill the expanded site with a more formal draft of the content to be used. Of course, we only create well written, interesting, and grammatically-correct content. One thing that greatly compromises the quality and credibility of a website is poorly written, boring, grammatically incorrect content. We run through the content many times, have different eyes check it over for form and function, and run the site through various programs to check for any errors. We have a dedicated content editor to ensure outstanding content in every site that we build, and she is involved in every project from the outset. Her inclusion for the entirety of the project also ensures that any important keywords for your business are used seamlessly/naturally in the site text for SEO (and PPC) purposes down the road. By the time that we deliver this expanded draft to our clients for feedback/guidance, we have already created a site that would be considered “done” by almost any other web designer. But at Web Brilliant we are far from done. Step Six – Detail Phase. This is where the magic happens. When we create a site, every detail is systematically thought out and planned. Should there be a line above the headers? If you use a particular design element on your main body, should the same element be on every inner page? Does your logo look better highlighted, or transparent? How much Social Media Optimization should be involved (SMO)? Do we need Facebook, and does Twitter make sense for your business type? We experiment and create examples for various elements of the design, constantly asking ourselves how we can improve it. When we say “detail”, we’re not just talking about graphic design elements. We’re also talking about typography (font styles and size), the use of negative space, text justification, captions, etc. Step Seven – Validation Phase. We check all of our sites for validation errors using XHTML and CSS. Most design firms don’t engage in active validation due to the time involved. 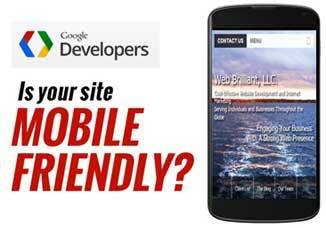 However, there are many reasons to validate a new website. Among other things, valuation is valuable as a debugging tool, as a guarantee that future Web platforms will handle the design elements of the site, eases maintenance, guarantees that best practices are followed. Step Eight – Browser, Smartphone, and Tablet Compatibility Phase. Perhaps the most difficult, time-consuming aspect of professional web design is making sure your website is standards-compliant. This means that it will look and function the same in all major browsers (Internet Explorer 6 and 7, Firefox, and Chrome), in all “non-computer” products such as iPhone, iPad, and Android-based products, and in all commonly used screen resolutions. 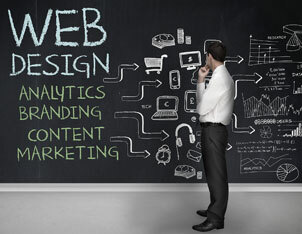 Therefore, the websites we create are all tested extensively in all of these formats. Step Nine – Image and Audio/Video Optimization Stage. This phase is very important in determining the speed of the site. Large video and audio files embedded in your web pages can slow down loading speeds in ways that can turn off site visitors. We always use Flash Video (.flv) compression for your video files and (.mp3) compression for your audio files. Not only are the file sizes smaller than using (.avi) or (.mpg) for video or (.wav) for audio, but the video/audio loads faster which means other elements on your web page will load faster, too. Images can also severely compromise the speed in which your website loads. We always compress your images using Photoshop, which decreases the size of the file and allows your web page to load quicker, which ultimately decreases the chance that your visitor will leave your website due to long load times. For this same reason, we also do not use tables on websites, and instead use CSS (Cascading Style Sheets). Step Ten – Client Review and Revision Phase. At this point, we turn the project back over to our clients. We ask you to take out your proverbial red pen, and send us any/all feedback in as detailed of a matter as possible. From there, we can make any changes that you’d like, and ensure that we are properly implementing your vision. This phase continues until you are 100% satisfied with the website that we have created together. Due to the large nature of client contact and collaboration that we bring to all of our engagements, most relevant issues are already handled by this point, and therefore this phase tends to be more like a celebration than a review :-). Step Eleven – Future Planning Phase. As our final step, we work with our clients to prepare a plan for site maintenance going forward, discuss your interest (if any) in online marketing such as SEO or PPC, and work with you in any other way to ensure that you are prepared to move forward with your site (and business). A website is a living and breathing creation, and the job is never really “finished”. Most of our clients remain with us, and ask us to handle any ongoing site maintenance or changes as they arise. But even if you choose to handle future site issues internally, you are always welcome to call or email us with any issue regarding the site we designed for you, and you will receive the same level of care that you received during the site creation process. "At Web Brilliant, we abide by the principle that there is no "one size fits all" approach to designing and creating a website. That said, we follow a systematic process with each of our clients"
"A website is a living and breathing creation, and the job is never really “finished”. 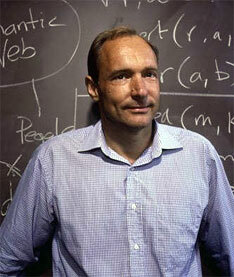 Most of our clients remain with us, and ask us to handle any ongoing site maintenance or changes as they arise"
Sir Timothy John Berners-Lee also known as TimBL, is an English computer scientist, best known as the inventor of the World Wide Web. He made a proposal for an information management system in March 1989, and he implemented the first successful communication between a Hypertext Transfer Protocol (HTTP) client and server via the Internet sometime around mid-November of that same year.